Transparency Market Research delivers key insights on the cut flower packaging market in its published report, titled “Global Cut Flower Packaging Market: Industry Analysis and Opportunity Assessment, 2018–2027.” In terms of revenue, the global cut flower packaging market is estimated to expand at a CAGR of 4.8% during the forecast period, owing to numerous factors, about which TMR offers thorough insights and forecast in this report. Cut flowers are flower buds trimmed from the plant bearing it. Cut flowers include a variety of flowers such as roses, carnations, orchids, lilies, and chrysanthemums among others. Cut flower packaging serves a dual purpose. It protects the flower buds as well as enhances its aesthetic appeal with a sophisticated finish. Cut flower packaging can be done in various packaging formats such as boxes & cartons, sleeves, and wrap sheets. 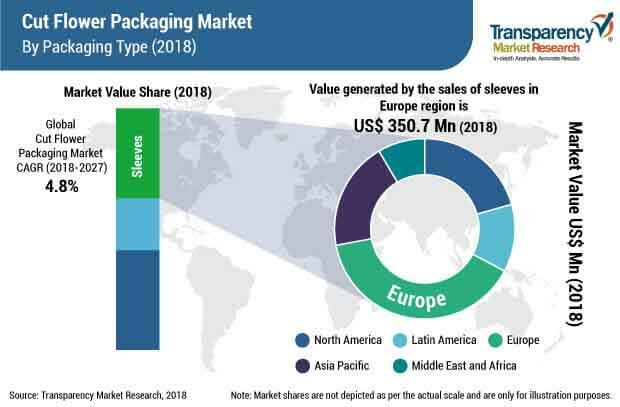 Among the various packaging types, the sleeves segment in the cut flower packaging market is witnessing higher growth and is projected to have a positive outlook during the forecast period. It is one of the most commonly used cut flower packaging formats for retail sales. It is the most attractive segment in the global cut flower packaging market for cut flower packaging, followed by the wrap sheets segment. Modified atmospheric (MAP) boxes are used for cut flower packaging. These boxes help in retaining the freshness for a longer time and reduce wastage of cut flowers due to spoilage. Florists dominate the distribution channel in the cut flower packaging market. They use visually attractive formats for cut flower packaging and provide creative as well as personalized solutions to the customers. Retail vendors and florists are using innovative wrapping materials to provide aesthetic appeal to cut flower packaging solutions. Burlaps and other jute-based wrappings are gaining traction in the cut flower packaging market. Production of cut flowers has remained concentrated to the European countries such as Netherlands, Germany, and the U.K. for a long time. It has been observed that this focus is shifting to countries such as Kenya, Ethiopia, and Columbia. This can be attributed to the availability of cheap labor and more favorable atmospheric conditions in these countries. Also, Japan, Ecuador, Malaysia, etc. have emerged as leading producers of cut flowers. The changing production dynamics have resulted in a shift in cut flower packaging trends. As the production sites have shifted away from the dominant consumption regions, the need for advanced packaging of cut flowers has surged. This has compelled the manufacturers of cut flower packaging to create packaging solutions which aid in retaining the freshness of the packaged flowers for a longer time so that everyone involved in the supply chain of cut flower packaging can maximize their profit margins. The cut flower packaging market is dominated by Europe and is expected to grow further during the forecast period. This can be attributed to the increasing sales of cut flowers via online stores. The increasing digitization and inclination of the millennial population towards buying products online, have resulted in a sharp increase in the online sales of cut flowers which, in turn, has increased the demand for cut flower packaging solutions. The key players in the global cut flower packaging market are Smurfit Kappa Group, DS Smith plc, Atlas Packaging, Uflex Ltd, Clondalkin Group Holdings BV, A-ROO Company LLC, Flamingo Holland Inc., Taghleef Industries LLC, Robert Mann Packaging, Hawaii Box & Packaging, Inc. Ernest Packaging Solutions, Mos Packaging Printing Factory, Flopak, Inc, Koen Pack USA, Inc., Sirane Ltd, Dilpack Kenya, Packaging Industries Ltd., JX Nippon ANCI Corporation, Pacombi Group BV and Broekhof Verpakkingen B.V. Many local and unorganized players are anticipated to contribute to the global cut flower packaging market during the forecast period.